Reformatio Legum Ecclesiasticarum was drawn up in 1552 by a commission headed by Thomas Cranmer (1489–1556), Archbishop of Canterbury, and a leader of the English Reformation. First published in 1571, it had later additions and amendments by Matthew Parker, and John Foxe, the martyrologist. Not only did it codify, thus justify, Henry’s earlier divorce from Catherine of Aragon, but it also provided a foundation for the legalisation of divorce. It established that marriage was not a sacrament, and that an innocent person might again marry in the case of adultery, absolute desertion, protracted absence, mortal enmities, or, cruelty. The code was never ratified by Parliament. This is a later reprint (1640) of a book that is a fundamental work to the English Reformation. 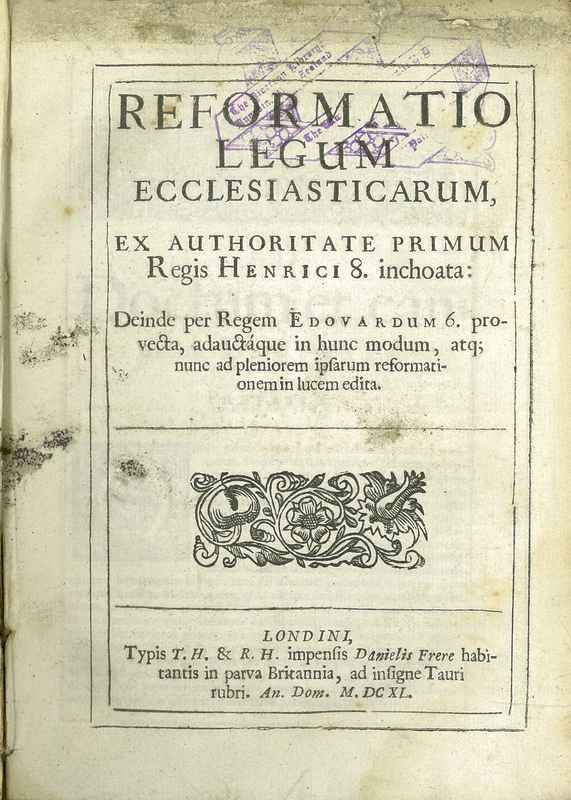 [Church of England], “Reformatio Legum Ecclesiasticarum, ex Authoritate Primum Regis Henrici 8 inchoata,” ourheritage.ac.nz | OUR Heritage, accessed April 26, 2019, http://ourheritage.ac.nz/items/show/10372.